The Foothill House is located one and one-half miles north of Calistoga. The inn is a turn of the century farm house surrounded by trees and wild life. 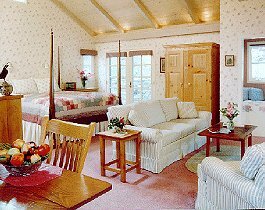 Suites and a luxurious cottage are available. Each suite is individually decorated with country antiques. All suites have private entrances and private bathrooms; some have Jacuzzis. 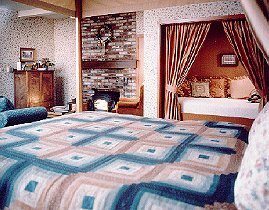 Each suite contains a fireplace and small refrigerator. Air conditioning is available for summer use. Each evening you will enjoy hors d'oeuvres and complimentary wine. A gourmet breakfast is served each morning. Calistoga is known for it's mud and mineral baths and bottled waters from it's geothermal wells. Hot air balloon rides and glider rides are close by. Golfing, hiking, bicycling, horseback riding are available. World famous wineries and gourmet restaurants are moments away. This and other Calistoga Bed and Breakfast Inns can be found here in The Register.